If Harry Potter played Quidditch in a flying car, then his car of choice would be the new Suzuki Ignis. Based on the same platform as the Suzuki Baleno, the Ignis is a combination of city car & crossover. 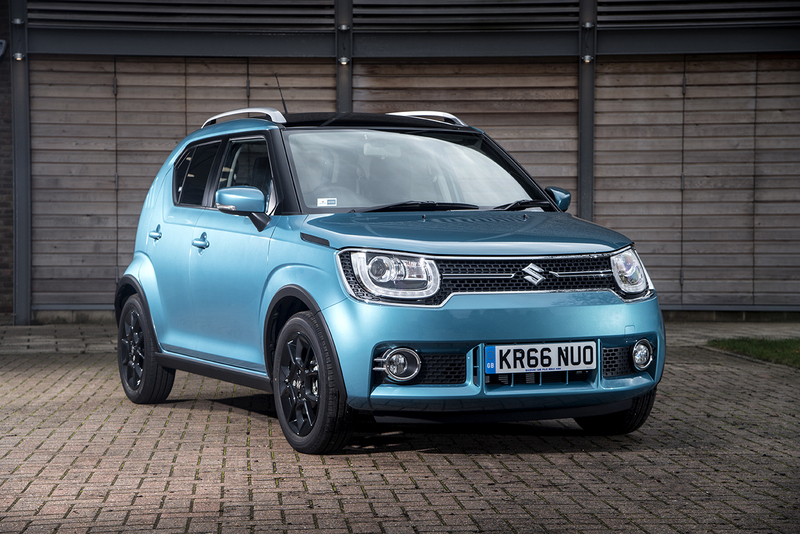 As Suzuki does small cars really well, it’s no surprise that the Ignis is a great little car that literally buzzes around the city whilst also happily keeping up with motorway traffic on a long trip. Offered in three trim levels, SZ3, SZ-T & SZ5, all come well equipped, with LED headlights, climate control & DAB radio as standard. 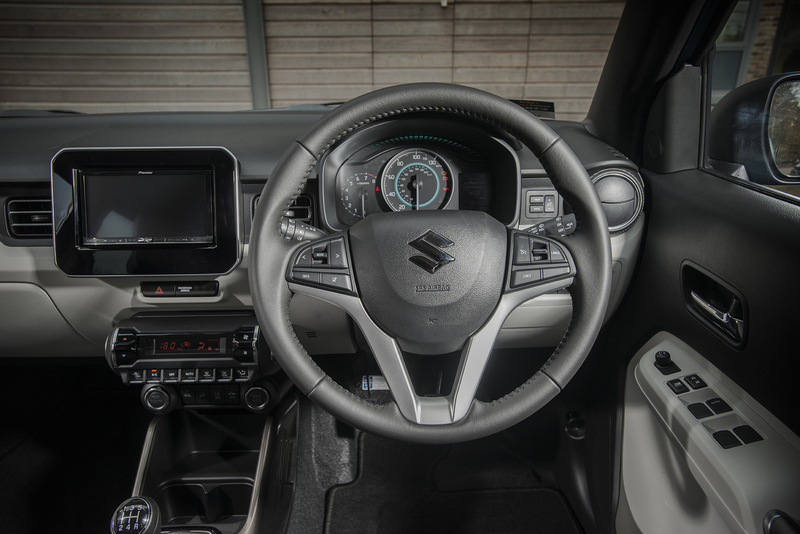 SZ-T adds Bluetooth, SatNav & emergency braking, while the SZ5 throws in keyless entry & start & a reversing camera, while those of you living in a hard to reach place, can opt for Allgrip 4WD on this version. The 1.2 petrol is available in all trims, while the SHVS version is offered in SZ5 trim only. With petrol cars gaining momentum & diesel cars in the bad-house, CC&V was loaned the 1.2 SZ-T 2WD Ignis the most likely best-seller, to try out in April. Two engine choices are available in the UK either the standard 1.2 petrol or the mild hybrid 1.2 SHVS. Both engines offer 89bhp, but the latter uses a battery to store energy to improve economy & emissions. All models come with a five-speed manual gearbox as standard, while the standard 1.2 can be had with a five-speed auto. Number one son did not take to the looks of the Ignis, which will give you some idea of how different it actually looks. Chunky wheel arches, large front headlights, a high roof with roof rails, small windows, 16” alloys & an elevated rear window, all add to the unique look of this car, a style which may prove as devisive, as the similarly sized Renault Twingo, Smart Four Four, Seat Mii, Skoda Citigo & VW Up! before it. Base models weigh in at just 810kg, which is lighter than a two-seat Smart ForTwo & this makes it perfect for the Seeker in a game of Quidditch. But, despite it’s Tonka-Toy looks & svelte exterior, it’s extremely practical. Prices range from just under £10,500 up to £15,000, with our test model coming in at £11,499 with the addition of orange with a black roof adding £650 to this cost. I spent a week in the Ignis & really enjoyed driving i especially around town, with it’s diminutive size making it really easy to park on the High Street. It also offers a fairly upright driving position with excellent visibility & it’s narrowness, 1.6m, makes it extremely easy to whizz around in town, where the nippy acceleration of 0-62mph in 11.8 seconds,with maximum torque coming in at 4,000 revs, shows the Ignis at it’s best. On the motorway, performance suffers. There are only five forward gears & even with just me in the car, you need to drop down into fourth-gear on occasion to get the Ignis back up to speed, something that was particularly noticeable on the M62 between Manchester & Leeds. After all 120Nm is not much to play with. Once up to speed though & if you can find a stretch of road where you can drive at constant speed in cruise control, it will happily keep up with even the fastest moving traffic. Add two or three passengers into the mix & the Ignis does slow down quite considerably. Up front, there’s actually plenty of head & leg room for six-footers & with the rear seats moving fore & aft, up to 165mm, standard on SZ-T models & above, you can even get a couple of adults in the back as well, although five would be really pushing it. The seat backs recline too, with simple to use catches enabling one to lower the rear seats simply & quickly. I took advantage of this with a trip to the tip, where the double height luggage floor came into use as well. The Ignis’s bootspace for models without the sliding rear seat is a sizeable 267 litres. 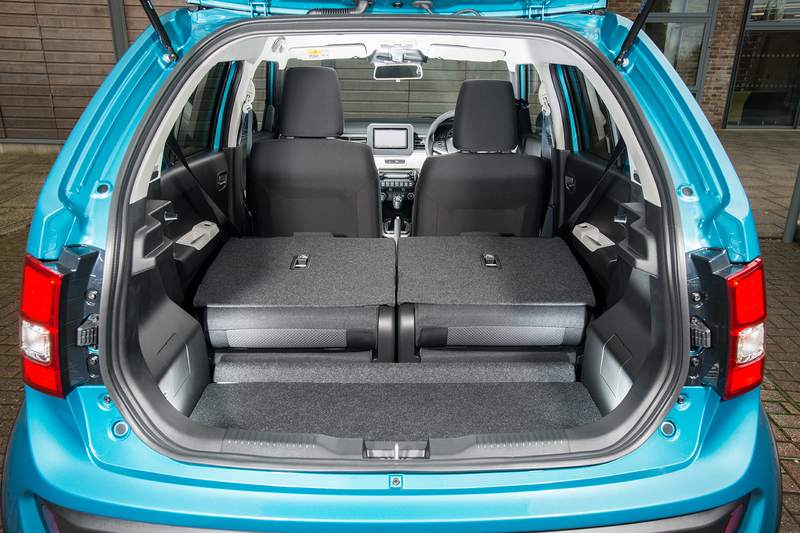 Internal storage is on offer with large door bins, two central cupholders & a split glovebox with the overall shape of the Ignis making it almost Tardis-like inside. Whilst the Ignis does zip around, it’s narrow tyres & soft suspension make for a slightly bumpy ride & the cars height also makes the body roll more noticeable. As too is wind noise & when in fourth gear engine noise as well. The car’s interior is, like the outside, quite funky. There’s a neat 2Tone effect for the upper & lower dashboard & the body coloured door pulls are cute as well. 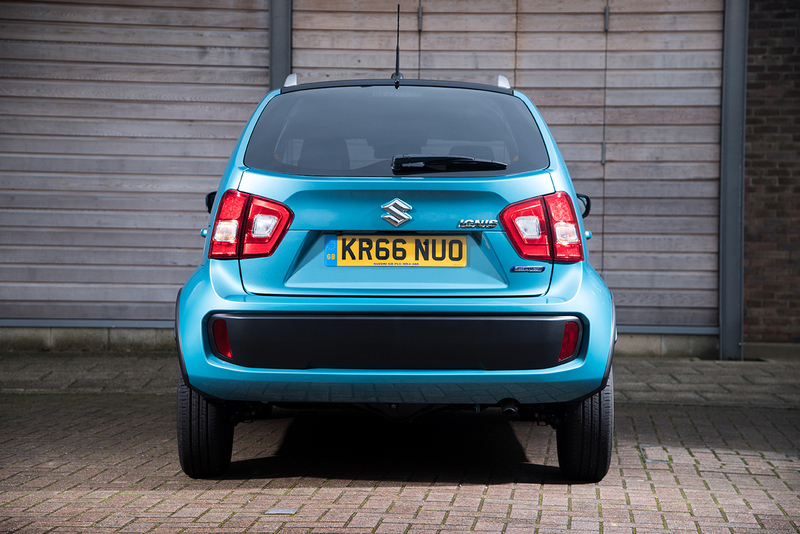 Quality is so-so, with most plastics feeling hard rather than soft, although with Suzuki’s bullet-proof reliability, the Ignis is built in Japan, they should last a long time. The dashboard is dominated by a 7″ central touchscreen. Whilst not as intuitive as some others on the market, this generally works well, although this Pioneer system feels dated & may prove too simple for some. It does though, allow for MirrorLink & Apple Car-Play connectivity. Equipment is generous, with StopStart, a rear parking camera, cruise control with speed limiter, electric front & rear windows, & keyless entry & start all on offer with the SZ-T. Automatic air-con, front fog lamps, LED projector headlamps, electrically adjustable door mirrors & LED daytime running lights are also fitted to the SZ-T 7. Super-mini safety comes in the form of ABS with EBD & Brake Assist, Hill Hold Control & Hill Descent Control & 6 airbags. Suzuki claim a combined fuel economy of 61.4mpg for the SZ-T with emissions of 104g/km. My week in the Ignis resulted in a combined figure of 51.9mpg, which is much closer to the claimed than in almost every car I have ever driven & with petrol cars soon to be less penalised than their diesel counterparts, by the tax man, this makes the small petrol-engined Ignis even more appealing. If I have a criticism of the Ignis, it’s simply that when compared to to driving a VW Up?, Skoda Citigo or SEAT Mii, the Ignis feels more fragile & is not as comfortable on the road as the three Volkswagen Group products. In fact the Renault Twingo is closer in many respects & of course Suzuki also offers the excellent Swift which has just been re launched & for just £2000 more, the larger Baleno, which come better equipped. Also, the Ignis comes with a 3 year, 60,000-mile warranty. That’s in line with most of the industry, although with brands like Hyundai & Kia offering 5 or 7 year warranties, it’s not as competitive as it could be. With our family pondering the purchase or lease of a city car for our son & daughter to drive, the Ignis certainly put itself in the mix. It’s cheap to buy & to run, comes well equipped with some notable safety options & is more practical than it’s competitors. On the downside, it’s funky looks could put off some & it does feel fragile when compared to the VW Group trio. Overall though, the Ignis is a refreshing addition to the super-mini category & should make in roads into the user-chooser fleet market, especially amongst the estate agent & district-nurse/health visitor public-sector customers.